Mt. Baker Ski Area is a ski resort with numerous challenging in-bound routes and many backcountry opportunities that surround it. 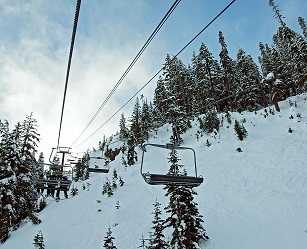 The backcountry is accessible from several chairlifts, and access is permitted from the resort following the Mt. Baker Ski Area backcountry policy. Mt. Baker is located in Whatcom County, Washington. To get there take exit 255 off Interstate 5, travel 52 miles east of Bellingham on State Hwy 542. It is located only an hour and 15 minutes from Bellingham. The base elevation of the Mt. Baker Ski Area is at 3,500 feet (1,067 m), while the peak of the resort is at 5,089 feet (1,551 m). It is about 10 miles (16 km) south of the 49th parallel, the international border with Canada.